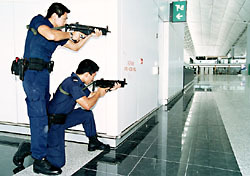 Airport Security Unit (ASU) members run through an anti-terrorist training exercise at the new airport at Chek Lap Kok which opens on 6 July. 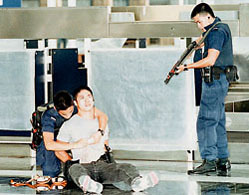 The sequence of events begins when two "terrorists" (ASU played by members) open fire with sub-machine guns in the departure hall of the airport. 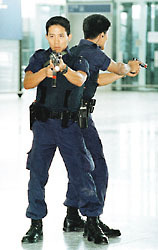 ASU teams then move in quickly to put down the attack, wounding one gunman --- and subduing the other. 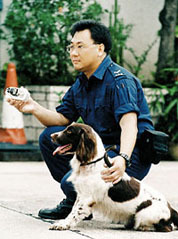 Police Dog Unit canines will play an increasingly vital role in airport security at Chek Lap Kok --- be it sniffing out illicit drugs and other contraband, or hidden bombs. 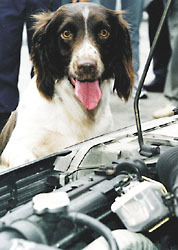 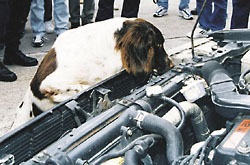 Here one of the unit's canine constable's sense of smell enables it to successfully search and find a "bomb" planted in the bonnet of a car parked at the airport. 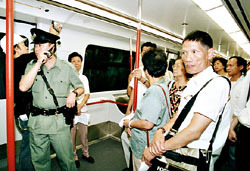 Police also play an important role in enforcing law and order in the new Lantau and Airport Railway(LAR). 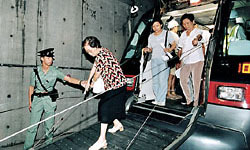 Here Force members take part in a recent emergency operation exercise carried out by the MTRC in the Western Immersed Tube that also involved Fire Services and other Emergency Units. 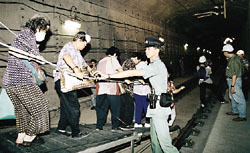 Incidents trained and prepared for include fire fighting, evacuation of trains and station, and the handling of bomb threats. 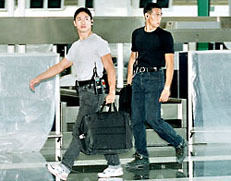 This site is best viewed by 800x600 or higher screen resolution.